Your journey has just begun. You have made the decision to find the best version of yourself and you're ready to fight for it. All we expect from you is the willpower and the dedication to work towards your goals. Everything else… we got it covered. Let’s go! This manual is made to guide you through your first use of the FightCamp app. FightCamp is a rich experience that has a lot to offer. It might get a bit confusing at first. This is why we have put together this manual that will answer all the questions you might have. We highly encourage you to, at least, skim through this manual before getting started. It will answer most of the questions you will have. If you cannot wait to get started, we can’t blame you. If at any point you run into some trouble, remember that this guide is here to help you along your FightCamp experience. Picture the best boxing gym in town. The best experience put together by a former U.S. National Boxing Team member and the best workouts led by the best trainers America has to offer. Now, picture all this awesomeness coming to you directly in your house. That’s the FightCamp promise. Whether you've never boxed before or you are coming in with some experience, you’ll find a challenging workout that fits your level. You'll also be challenged by our FightCamp Sprints which are short, standardized workouts that are scored by our FightCamp Punch Trackers. These short and intense Sprints are like mini fitness-games and are a great way to benchmark your progress against yourself and others over-time. Finally, a number of tutorial videos are also included to help you brush up on and build upon your boxing skills as you progress in your FightCamp journey. If you are entering FightCamp with little-to-no boxing experience, we have designed a beginner’s path just for you. The Prospect Path will teach you proper technique by taking you from the basics of boxing to intense punch combinations, and it will get you in shape by starting with 4 rounders and gradually increasing to 8 rounders. Just like any great brick-and-mortar boxing gym, FightCamp offers the opportunity to be a part of a community of like-minded people who will push you and support you on your journey. Many of the FightCamp trainers and team members offer additional support within the community. Make sure to join our FightCamp Facebook Community. That’s FightCamp in a nutshell and we're so happy that you have made the choice to embark on this life-changing transformation with us. The journey from where you are now to where you want to be starts with your first punch. Let’s do it! The FightCamp App is available for iOS devices and can be downloaded via the App Store. To sign into the FightCamp app, enter the email address and password you used when you signed up on the FightCamp website. You can also create an account by clicking “Don’t have an account?”. Once you are signed in, you will be brought to the Prospect Path. On the tab bar you can select Prospect Path, Workouts, Activity, or More. Select and filter workouts in the Workouts tab, where you can view the full library. See your cumulative workout history in the Activity tab. Access your profile, report a problem, sign out, view tutorials and the user manual from the More tab. If you want someone else to use FightCamp app, you can create a new account directly in the FightCamp app. Both you and your friend can use the same pair of Punch Trackers to unlock all of the workouts. Open the app and click on “Forgot your password?” Enter your email and press Reset. You will receive an email with instructions on how to update your password. Feel free to reach out to info@joinfightcamp.com if you need further help. What equipment is needed ? A Punching Bag is needed for the best FightCamp experience as it truly provides a superior workout to shadowboxing (punching in the air). If a bag does not fit into your lifestyle at the moment, you can still get a great workout with shadowboxing but we caution that this may make the punches harder to recognize for our punch-trackers (you will have to punch with appropriate velocity for them to trigger). Any bag will work, but free-standing bags like ours are more convenient in many ways because they don't require you to permanently drill into your ceiling or wall to hang and they can be move to the corner of a room when not in use. If you think a free-standing bag Is the best fit for you, we highly recommend the FightCamp bag as It Is the best free standing bag on the market (watch the demo video on our store for more info on why it is the best bag). Boxing Gloves are necessary to protect your knuckles and wrists from the impact of hitting a bag. Even If you decide to shadowbox to the workouts, we suggest wearing gloves because having the extra weight on your hands will provide a better workout. Any gloves will do, here are the ones FightCamp offers! Quick-Wraps (or traditional boxing handwraps) are highly recommended. The FightCamp quick wraps are designed to hold your Punch Trackers in place and also offer wrist and knuckle protection. They also will make sure that the Punch Trackers are placed properly so they can track your punches accurately. Improperly placing the punch trackers can affect accuracy. Similarly, trackers that move inside of your hand-wraps will also lose accuracy. 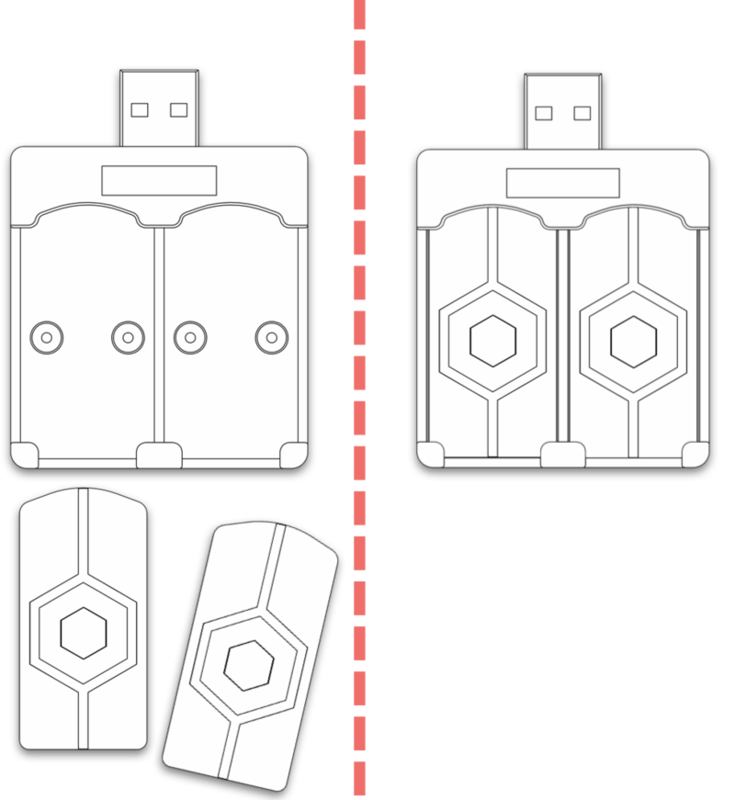 The Punch Trackers come with a charging station and they should be charged as soon as you receive them. We recommend that you always have them charging while not in use so that you are always ready to go when you are ready to start a workout. If you are missing any equipment, visit our store. If you have our Essentials Kit, the maximum area taken by our rubber workout mat is 8’ x 4’ but this can be adjusted to a different size to best fit your needs. These dimensions will allow for enough space for the bag and for you to perform all the bodyweight exercises. The minimum space required for a FightCamp setup could be smaller than 8’ x 4’, depending on your height and arm length. For example, 6’ x 4’ could be realistic if you’re short enough to do exercises such as burpees, planks and jumping jacks in a space like this. If you’re taller than 6’, you will need more space. These dimensions do not necessarily include the space needed to set up your iOS device, since this depends on whether you use a TV, an iPad or an iPhone. If you’re using an iPad propped on a chair next to your bag, for example, this will fit perfectly in an 8’ x 4’ space. There are two methods to stream to your TV. This is the best way to stream FightCamp to your TV without experiencing latency problems. Use the adapter with any HDMI cable connecting your iOS device to your TV - there shouldn't be any lag this way! Note: The official Apple adapter is of much higher quality than other Lightning to HDMI adapters on the market. Purchase the adapter here. You can stream to your TV using an Apple TV and your iOS device with AirPlay. Make sure that both devices are connected to the same network and use the Screen Mirroring functionalities on your iOS device. For more information on how to use AirPlay, please visit the Apple Website. What should I use to fill the FightCamp bag? You can fill our Freestanding bag with water, sand or both depending on what you’re looking for in terms of weight and convenience. Freestanding punching bags use a reservoir as a counterweight to simulate the resistance and swing of a hanging bag - more weight means more resistance and less swing.We recommend going with sand for the best experience during your workouts. To get the best boxing experience, we recommend filling the base of the bag with 350 lbs of sand. That will make the bag much heavier and therefore less likely to move around during a workout. That being said, filling a bag with sand and emptying the sand out is more inconvenient. Water is an option that is much more convenient - the base of the bag will be easier to fill, empty, and move around when needed. However, the bag will be lighter with water, at approximately 250lbs, which means it will move more during your workouts. For extra weight, water can be added to the sand, which brings the weight up to about 450lbs. We do caution that this will also make it more difficult for you to move around a room. You will probably need a hose to remove the wet sand inside if you ever need to move the bag a significant distance. Please Note: Getting used to hitting a free-standing bag is a skill just like getting used to hitting a hanging bag. You learn to work around the movement of a free-standing bag just like you learn to adjust to the swinging of a hanging bag. Both types of bags have their positives and drawbacks. Can I shadowbox with FightCamp instead of hitting a bag? The short answer is YES, you can choose to shadowbox with FightCamp Instead of hitting a bag and you will still get a great workout! That said, we do truly feel that the FightCamp experience is maximized with a bag. Hitting something provides a much more challenging workout and also relieves a ton of stress! We also caution that our Punch Trackers work a lot better when you hit a bag. You will notice that with shadowboxing, there might be some difficulties with punching hard or fast enough to trigger the trackers. If you do shadowbox with significant velocity, your punches will be counted but this is sometimes difficult to do with hooks and uppercuts, especially when you are getting tired. Please keep that in mind if you decide to shadowbox with FightCamp. Why is my Audio and Video Delayed? If you’re streaming to your Apple TV using Airplay, the delay may be caused by a poor network. To reduce this delay, it is optimal to have a strong router and to have your phone and setup placed close to it, in the same room as the router at the very least, if not right next to it. If you’re streaming to your TV using a HDMI cable and an adapter, the delay may be caused by a problem with the adapter. We strongly recommend Apple Lightning to HDMI adapter (Lightning Digital AV Adapter), since it is of much higher quality than any other adapter on the market. Cheaper adapters may unfortunately negatively affect your experience, cause delay with the audio, stop working regularly, and affect the workouts' display. Having a poor internet connectivity, like a weak WiFi or a busy WiFi, may also induce a delay. Can I use MMA Gloves? We do not recommend MMA gloves because they do not offer enough protection, especially for those newer to boxing who aren't used to punching yet. 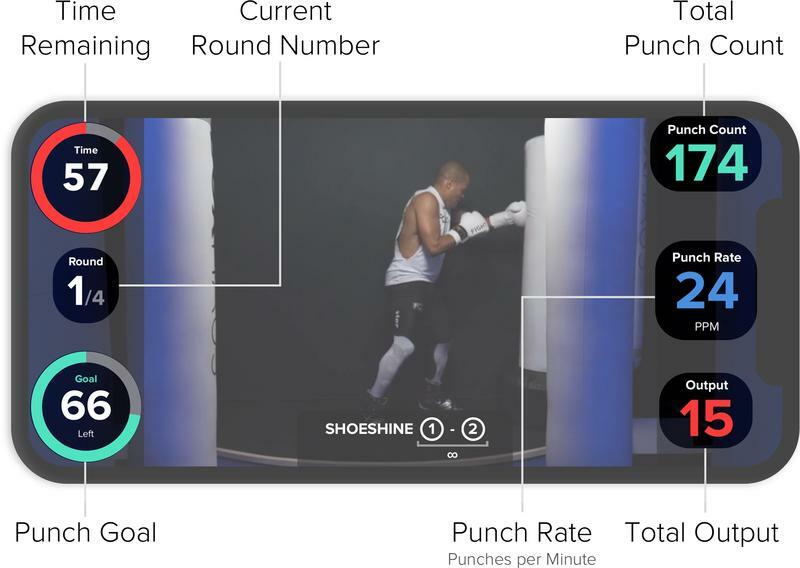 When using the Punch Trackers for the first time, you need to activate them to be able to connect them to the FightCamp App. The Activation only needs to be done once. 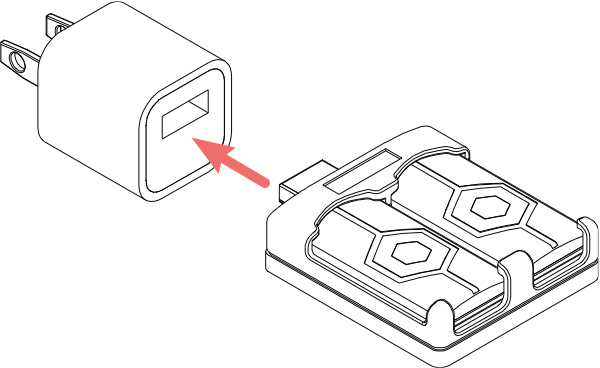 Place the Punch Trackers in the charger (rounded edge facing towards the USB Port). Power up the charger with a USB port. The lights on your Punch Trackers will then light up. At this point, the Punch Trackers are now activated and you can start using them! It takes approximately 60 minutes to fully charge the Punch Trackers. The lights on the Punch Trackers give a general indication of battery level. When the tracker light is Yellow, the tracker is charging. When the tracker light is Green, the tracker is 90% charged. When the tracker light is Blinking Green, the tracker is fully charged. You can also see the charge level of your trackers through the connection menu. The Punch Trackers will last through roughly 10 hours of continuous use before you need to charge them again. It is completely fine (even recommended) to keep the trackers on their charging station when not using them. To wake the trackers up, simply double-tap them (firmly). At this point, you should see the lights blink. They will stop looking for the FightCamp app after 15 seconds if they haven't found it. When Punch Trackers are slowly strobing, it means that they are connected and ready to be used. When trackers are in Sleep Mode, they are not active and consume very little energy. The battery can last through 2-3 weeks of inactivity before it needs to be recharged. Double-tapping the trackers wakes them up. You can put the trackers in sleep mode through the connection menu. After doing so, try not to move them around and activate them while the app is still open. If they start blinking and searching for a connection after you have closed the app, remember that they should only do so for 15 seconds. If they continue to blink, go back into the app and put them back in sleep mode. When the trackers are turned off, they don't consume energy at all. The battery can be preserved for months. Mounting the trackers properly is important in order to get accurate results. The tracker needs to be placed on your forearm, just below your wrist. The rounded edge must face towards the knuckles and the LED light must be pointing up. Avoid placing the tracker at an angle. Make sure the rounded edge points straight at your knuckles. Put at least two turns of your hand-wraps over the trackers to make sure they are properly secured. The trackers must be placed on the wrist. Punching while holding the trackers in the hand leads to inaccurate results. It's not recommended to place the trackers directly on the skin. How can I wash my trackers? Rinse the trackers with water or wipe it with a small amount of rubbing alcohol. Do NOT use hand soap, body soap, dish soap, hand sanitizers, cleaning wipes or household cleaners. Always dry the trackers well before putting them back on. Do not soak in water for any extended period of time. Are the trackers water resistant? The Punch Trackers are water resistant but not waterproof. This means that we do not cover water damage in our warranty. Make sure not to wash your trackers with your workout clothes. What is the range of the trackers? This being said, you can expect your trackers to have a range of 30 feet or more in most situations. Don't worry If you get out of range and/or if the trackers disconnect during a workout, your punches are all saved on the trackers. When they re-connect, all of your punch data will be updated on the app. Click on each workout to get more information and/or to start the workout. If you click on the “Overview” button, you will be able to look at the programming featured in that workout. Click the “Start” button to start the workout. Classic Workouts: These are trainer-led, boxing-workouts that feature a mix of punching combinations and HIIT exercises. Each 4-to-12 round workout features 3-minute rounds with 1-minute rests in between rounds. Each workout starts with a brief warmup and ends with a brief cooldown. Boxing Skills: These short tutorial videos show you how to properly throw the punches and also how to properly execute other basic boxing moves like slips, rolls and steps. Boxing Base Workouts: These workouts typically accompany Boxing Skills tutorial and are workouts that are meant to reinforce the technique covered in the preceding tutorial video. Repetition is essential to developing proper muscle memory and for that reason, we encourage new users with little to no experience to complete these Boxing Base workouts multiple times. 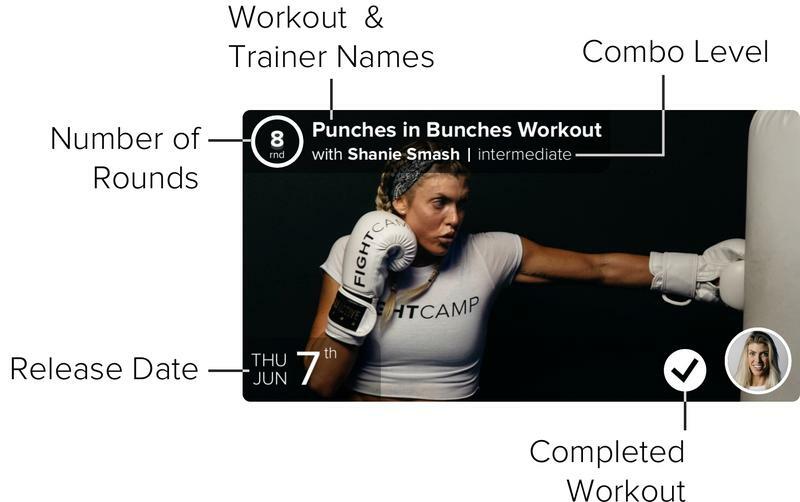 FightCamp Sprints: These are short and intense workouts that use FightCamp’s Punch Trackers to give you an objective score each time you complete one. These data-driven workouts are a perfect way for you to benchmark yourself over-time or next to other FightCamp users. Open: These feature basic, entry-level punch combinations and are perfect for those at all different skill levels. Don’t worry, they can be just as physically difficult as any of the FightCamp Intermediate or Advanced-level FightCamp workouts. Intermediate: These workouts are meant for those who are entering FightCamp with 3+ months of prior experience at a boxing gym (or similar martial arts gym). They often Include moves like slips, rolls and steps and the punch-combos can stretch between 6-10 punches simultaneously. If you struggle with our Intermediate workouts even a little bit, we suggest that you go through our Prospect Path which will get you ready to master these slightly more difficult workouts! Advanced-level workouts are for those entering FightCamp with 10+ months of boxing experience at a boxing gym (or similar martial arts gym). These workouts challenge you both mentally and physically and often feature difficult punch-combos than can sometimes exceed 15-straight punches. We highly suggest you complete the prospect path and get comfortable with Intermediate-level workouts before moving into the advanced workouts. If you have any questions related to which workout would be the best fit for you, please feel free to ask those on our FightCamp Facebook Community. 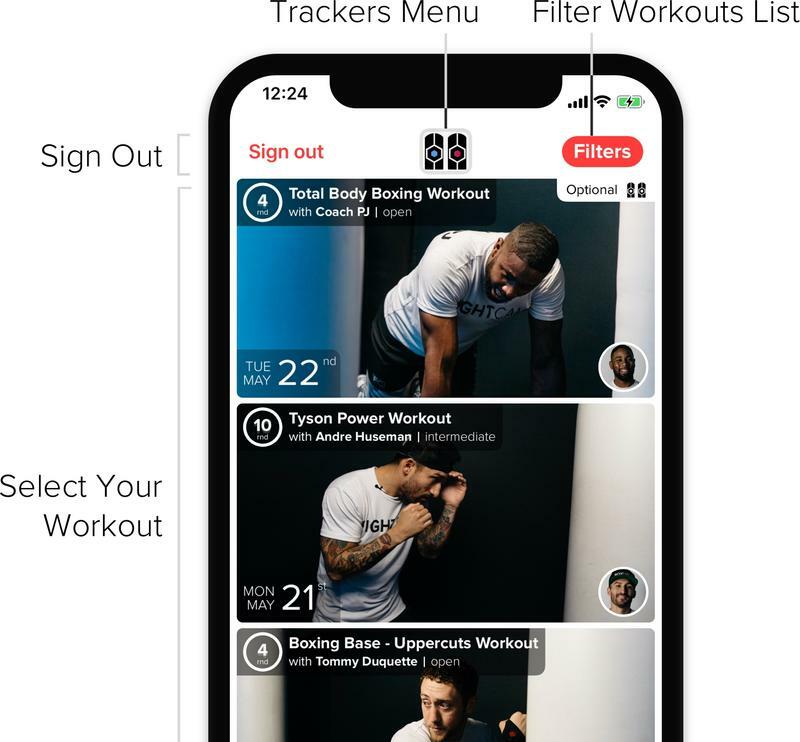 When you click on the “Filters” button located at the top-right corner of your app-screen, you will be able to filter the list by type of workout first. For Classic Workouts, you can filter further by trainer, workout-length and workout-level. The “Filters” button will always be highlighted when there’s an active filter applied. If you have any questions related to which workout would be the best fit for you, please feel free to ask those on our FightCamp Facebook Community. 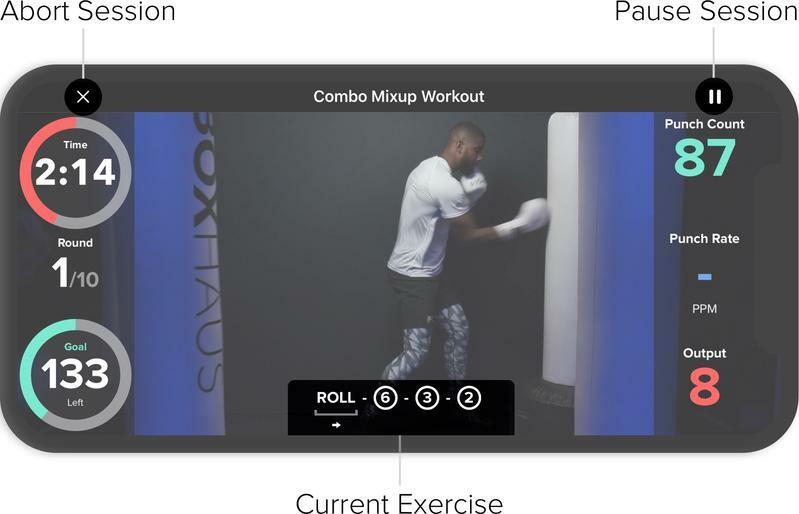 If you are new to boxing or just need a refresher, we highly recommend that you get started with the Prospect Path. By following this path, you will learn the basics of proper boxing technique and get an awesome workout in the process. You can find the details Here. Once you have selected a workout and pressed "Start," the workout video will begin. Each workout starts with a brief welcome intro, feel free to skip that by pressing the “Skip” button at any time. Each workout starts with a 2-minute warmup. When the warmup begins, you will notice that some animations will appear on the screen. The image below explains each of these animations. If you press anywhere on the screen, a Control Bar will appear at the top. The Control Bar gives you access to exit or pause the workout. The FightCamp Punch Trackers measure your punch volume, Punch Rate and Output in real-time. All of these stats are displayed live during your workout. You can only accumulate punches while you are doing an interval that calls for punches. For intervals that only call for "HIIT" bodyweight movements, the punch-based metrics will be temporarily frozen. Here is how the Live Screen changes depending on if it is a punch-based interval or not (you will notice that the metrics are faded-out when the trackers aren't tracking). For every round, you will have a minimum punch goal that you are directed to meet. Once you reach this goal for the round, you will get a check mark! If you have a hard time reaching the punch goal for any given round or workout, challenge yourself to try the workout again and beat it! The exercise bar shows you the current exercise you should be doing during a specific interval. For punching combinations, we use the boxing number system (numbers 1-6) to denote the punches that are called for in the combo. 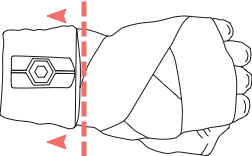 For punches to the head, numbers are always displayed inside of circles and for punches to the body, they are displayed inside of squares. Below is a list of the punches and the numbers used to represent them. When the 6 numbers above are displayed with a “b” next to them, that connotes throwing that punch to the body. So, 1b = a jab to the body, and so on. If you are new to boxing, the Prospect Path will get you up to speed on this system. Output is a total measure of your punches that takes into account maximum velocity, quickness and volume. The best output scores are achieved by reaching high max velocities, in a short punching time and in high volumes. To maximize your output, aim towards improving each metric without sacrificing any of the 3 (max velocity, quickness and volume). Fundamentally, this comes down to improving conditioning and technique. Your goal during a FightCamp workout should be to maximize your Output score while simultaneously meeting (or exceeding) your punch goal for that workout (punch goals are displayed round-by-round, more on that below). How can I increase my output? The best output scores are from people reaching high max velocities, in a short punching time and in high volumes. To maximize your output, aim towards improving each of these metrics. This comes down to improving conditioning and technique. Conditioning improves the volume of punches, the amount of punches you can keep at your max velocity, and the amount of punches you can keep at your quickest. Increase quickness with faster muscle activation, more optimal punch motions and quicker coordination within all the moving parts of your body. 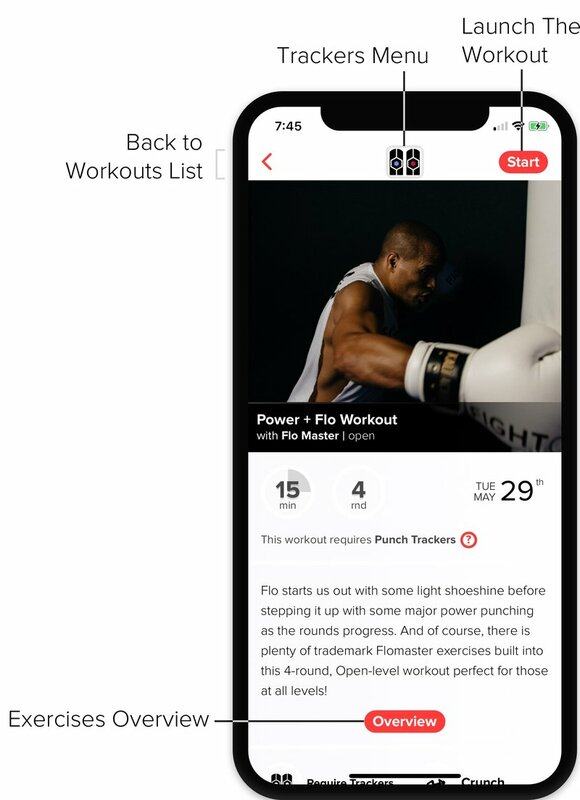 To keep track of your stats for particular workouts you have completed, click on that workout in the workout list and scroll down to the stats section below the workout description. You will see your session history for the workout, which includes the number of punches thrown and your output from that session, and a graph showing your improvement. Below your sessions history, you can find the leaderboard rankings for that particular workout. When trackers are in Sleep Mode, they aren't active and consume very little energy. The battery can last 2-3 weeks In Sleep Mode before it needs to be recharged. Double-tapping the trackers wakes them up. 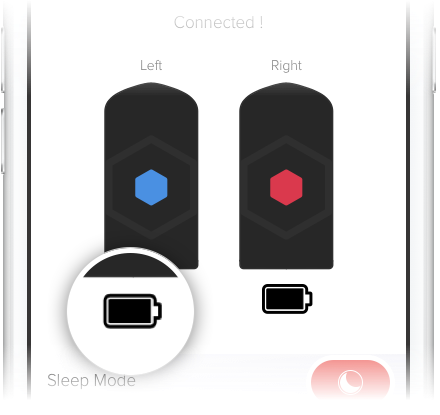 They will connect to the FightCamp app if the app is open, otherwise they will look to connect for 15 seconds before going back into Sleep Mode. You can put the trackers in Sleep Mode through the trackers menu. When the trackers are turned off, they don't consume energy at all. The battery can be preserved for months. In order to turn them on again, you need to reactivate the trackers by following the instructions in the 'Activation' section of this guide. You can turn off your trackers through the tracker menu. Your journey has just begun. You have made the decision to find the best version of yourself... and you're ready to fight for it. All we expect from you is the willpower and the dedication to work towards your goals. Everything else… we got it covered. Let’s go! Post a question in the FightCamp Facebook Community.